Trying to find the perfect Gothic music to listen to that also incorporates Celtic-sounding elements is nearly impossible. Luckily, Amalie Bruun’s one-woman musical project, Myrkur, is a brilliant example of how to correctly mix the occult and the medieval. Bruun’s ghostlike music sways back-and-forth between ancient Icelandic folk and bone-chilling gothic. Myrkur, literally meaning “darkness,” will sweep its audience off their feet and guide them to another time altogether as it plays with the contrasts of light and dark, soft and heavy. 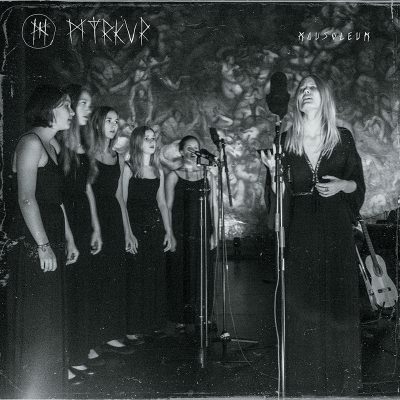 Myrkur’s album, Mausoleum, is a live, reimagined collection of Bruun’s music from her previous album, M, as well as one new song and a Bathory cover, which was recorded at the historic Emanuel Vigeland Mausoleum in Oslo, Norway, and is accompanied by the Norwegian Girls Choir. You can also check out Myrkur’s heavy metal music on their website, (myrkur.bandcamp.com). The fact that Bruun can so flawlessly sing such difficult and melodic ballads is incredible. Mausoleum’s instruments include piano, guitar and Bruun’s eerie and angelic vocals. The composition of Mausoleum is as gentle as it is fierce. From the very first track, “Vølvens Spådom,” my inner witch was crying and dancing with joy as Bruun’s melodic voice echoed and flowed with the harmonic background chorus. Mausoleum is reminiscent of traditional Gaelic music while maintaining a Tim Burton–esque quality. Even the band’s signature symbol resembles a Pagan sigil or rune, adding to the witching quality of the music. “Skøgen Skulle Dø” incorporates more of the choir with an introduction that sounds oddly like a church choir with its echoing vocals, but soon leads into clashing half-notes on the piano that bring the album back to its darker self. “Den Lille Piges Død” led me straight into my childhood fantasy novels and movies, such as Lord of the Rings. Beginning with a simplistic yet beautiful introduction of Bruun’s vocals, the song moves into harmonizing instrumentation and clashing notes between the piano and the guitar, which at times sounds similar to the lute. “Onde Børn,” another lovely piece with a gentler quality, was changed into a heavy metal piece later on—and listening to the two side by side is a fascinating experience, because I heard Bruun’s talent and ability successfully move between genres while maintaining the essence of her style. Myrkur is relaxing but also compels you to dance or write or sing along. I found myself listening intensely to tireless mixtures of sound and harmony. The ghostly quality of Myrkur’s music adds an ancient, magical element to our rather somber and mundane world. The trajectory of the album continues in wave-like qualities, moving from vocals into instrumental, solo to choir and ancient to modern goth. Bruun’s voice echoes throughout Mausoleum, creating a calming effect that nicely juxtaposes the haunted, supernatural overtone of the album.